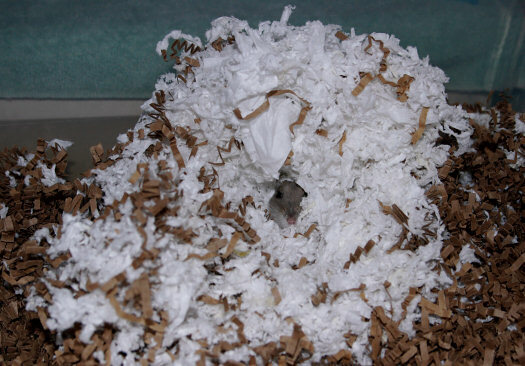 If you tear up tissue into smallish pieces and put them into your hamster cage, they’ll chew them up and line their nests with them. One of mine gets pretty fancy about it, too. This always makes me feel guilty when I clean the cage, because it destroys her fancy nest-work and has to start all over. I guess it gives them something to do tho. 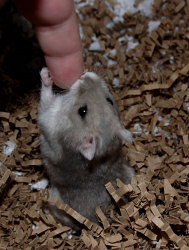 The lighter grey hamster has learned that a hand inside the cage equals probable tasty treats, and thus she stands up on her hind legs, waving her front paws in the air to grab my finger in anticipation. Sometimes she even stands up like that if she sees I’m walking around in the room. She kind of looks like a mini-dancing bear. I could probably train her to walk on her hind legs as a ‘trick’, but I’m too lazy. 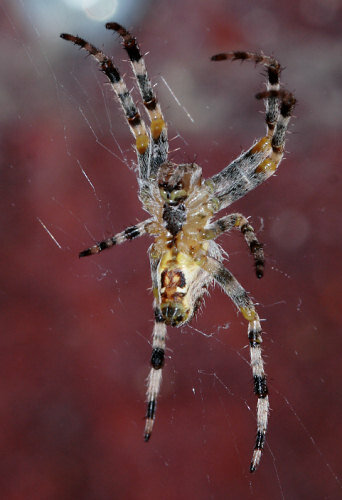 It’s really cute tho. 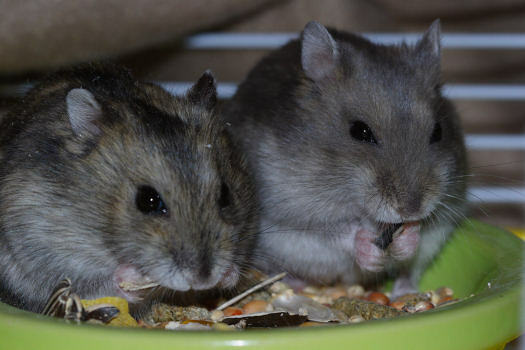 During the early Winter I finally decided to acquire some dwarf hamsters as pets. They’re very small and as adorable as can be. These two have very different personalities and so…you guessed it…I have a favorite. The one on the right. She’s light grey, more active/amusing and more affectionate. For a hamster, that is. Much as I love cats, I’m still unsure if I want another cat once Baby dies - the care and time-commitment isn’t as appealing to me now as it was when I was twenty - and since dwarf hamsters are VERY simple to care for and have a short lifespan, I thought they’d be an option. 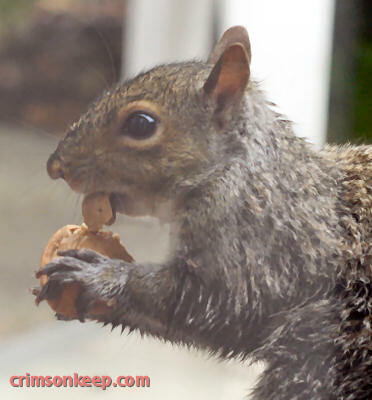 I’d really like a squirrel, but, well, that’s not an option here. 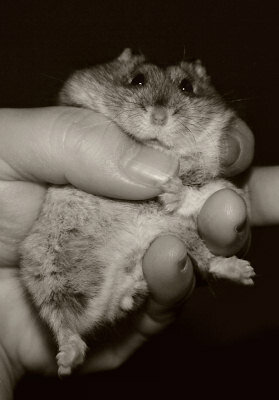 Dwarf hamsters are awesome tho, so I’m happy. The first big rainstorm has hit the West Coast, the leftover remains of some tropical storm. 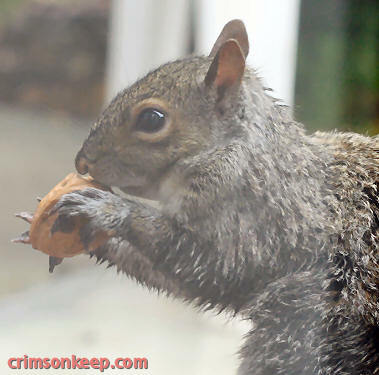 It’s been rainy and windy all day. It’s also made me realize hubby never got around to clearing out the small sections of rain gutter this summer, since there’s one spot in the back of the house that has become a near-waterfall. 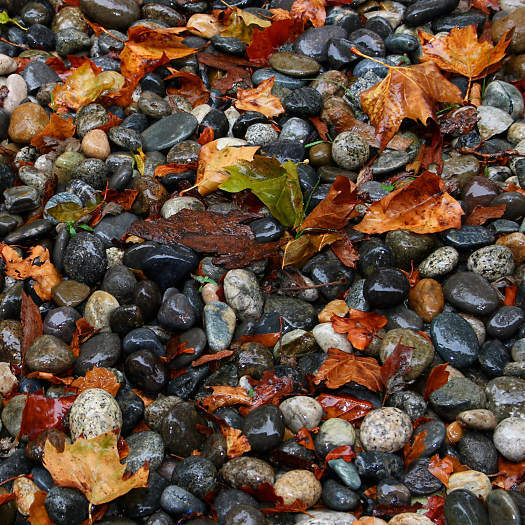 Anyway…the rocks we put down in the front yard, combined with the falling maple leaves, made for a pretty picture. 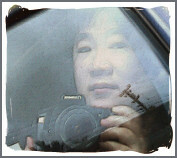 These are a couple of pics from when hubby and I went up to San Francisco to spend some time with his sister and brother. 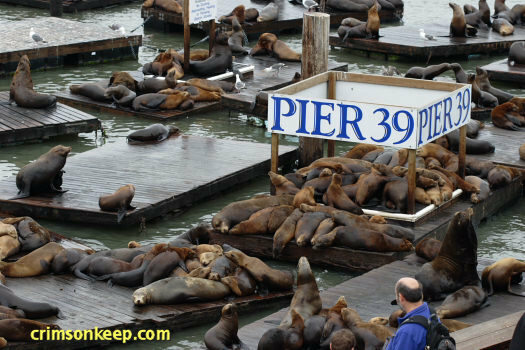 Pier 39 has the one area for seals to hang out in, and there were a lot of them that day. The other photo is a random shot of a man and his daughter near a bit of beach, close to Fisherman’s Wharf. 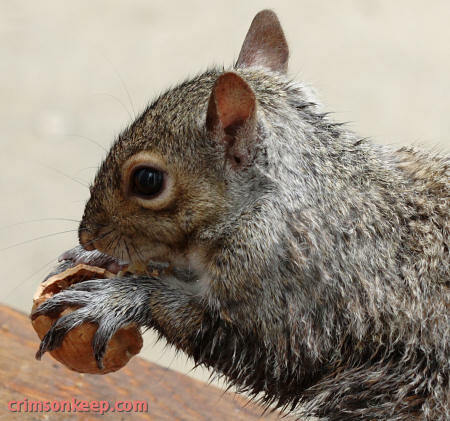 Question: How long does it take for a squirrel to crack open a walnut? Answer: Not long at all.